SRINAGAR: For the entire day the phase one of the Lok Sabha elections were peaceful. As the officials started closing the EVMs, there was tension in Handwara where one minor boy was reportedly killed. 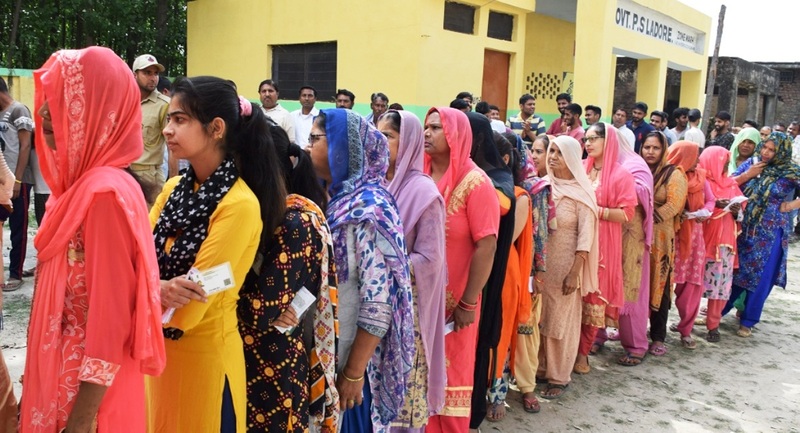 Voters outside polling station in Jammu during the first phase of Lok Sabha elections in Jammu, on April 11, 2019. Details revealed that in Qaziabad (Kralgund) when the polling staff was being escorted out of the local polling station, they came under stone pelting. In quick retaliation, shells were fired and one hit the head of Owais Mushtaq. He died in the hospital. He was initially rushed to Kralgund and later to Handwara where he was declared brought dead. Reports said at least one more youth was injured and is still not out of danger. Owais killing adds blood to the day-long peaceful exercise that, according to officials saw the participation of more than 34.6 per cent of the electors of the north Kashmir’s Baramulla Lok Sabha constituency. This segment has 15 assembly seats and is spread over districts of Kupwara, Baramulla and Bandipore. It has three of its assembly segments located on the Line of Control – Gurez (Bandipore), Uri (Baramulla) and Karnah (Kupwara). All the border belts participated in huge numbers. Interestingly, however, the 2014 participation was better at 39.6 per cent. The district wise current participation was 24.02 per cent for Baramulla, 31.83 per cent for Bandipore and 51.7 per cent for Kupwara. All the three districts had better participation in 2014 with Kupwara topping the list at 63 per cent. Despite the vastness of the constituency, its epicentre was in Kupwara, mostly in the Handwara-Langate belts which are contagious to each other. It was because Sajjad Lone’s Peoples Conference is primarily based in Handwara and Engineer Rasheed has been representing Langate for the last two terms. At a few places, there were reports of stone pelting as well. These include Palhalan and a few areas in Rafiabad. Reports said that SMHS received at least three cases of pellet injuries which are being treated. During the peak campaigning, it was said that the main contest is between the National Conference’s Mohammad Akbar Lone and Peoples Conference. But the voting pattern suggested that it might be a square contest with Engineer Rasheed and PDP candidate also in the ring. Even at places where Engineer had not gone, there were voters who said they had voted for him. It might be his social media reach that might have helped him to an extent. 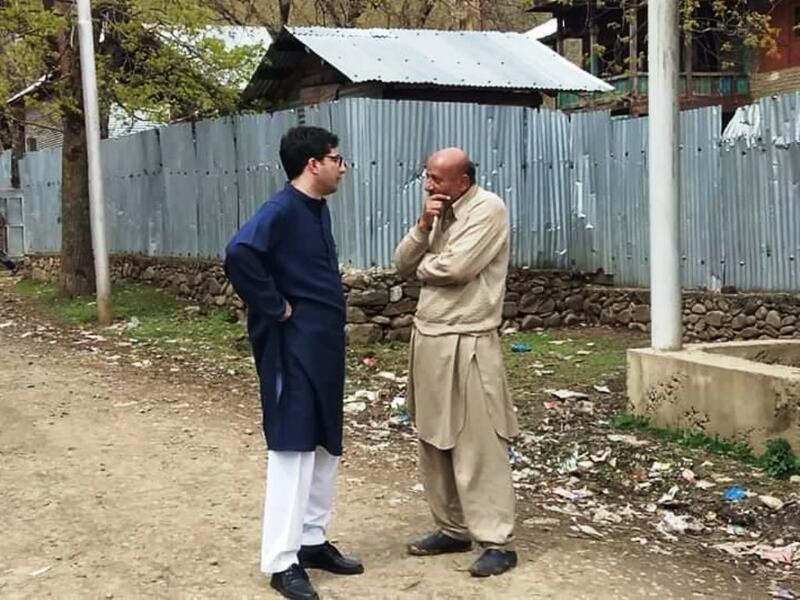 Talking to reporters in Langate, Rasheed said he tried his best to canvass the voters that he should be elected for the purpose of highlighting the crisis Kashmir is perpetually in. “If I cannot make it, it will be unfortunate as a lot of people were convinced to vote for me for an obvious purpose,” he said. Sajjad Lone told reporters that if his candidate wins, he will be unlike the Delhi boy and Delhi girl – a reference to Omar Abdullah and Mehbooba Mufti. He said his party did talk about the issues of Article 370 and Article 35A but they mainly focussed on the development. Handwara like its adjacent belts has always voted in huge numbers. On Thursday, however, there were not many serpentine lines but voters came in small groups, voted and left. In fact, the political parties had hired a number of vehicles to drive the voters – especially women to the polling booths, and after voting dropping them at home. 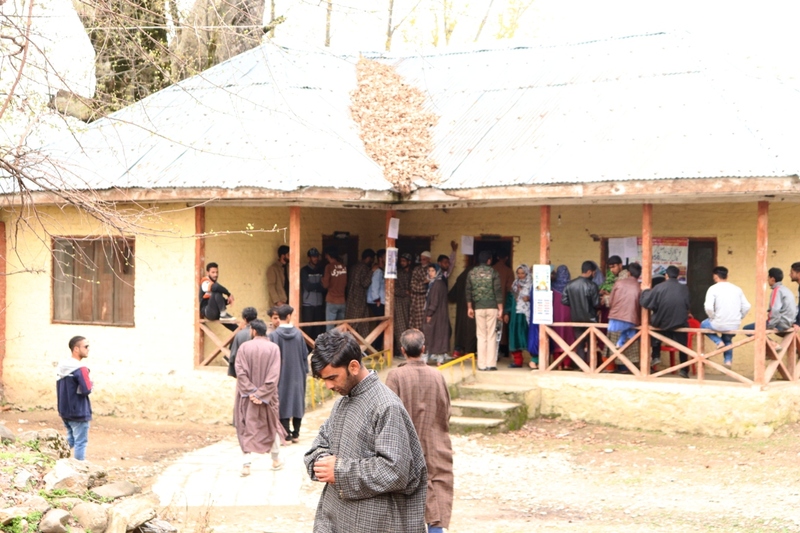 The polling was brisk in Kupwara, Handawara and Langate. But the crowds started thinning as one took the Rafiabad road for Baramulla. There were quite a few people in polling stations and around them in most of the Rafiabad belt. In Baramulla, it was almost deserted and Sopore was exhibiting the same traditional boycott that is usually seen in all kind of elections. Even in Sangrama, there were not many voters in the polling stations. Unlike Palhalan, there were lot many voters in long lines in Pattan. Tangmarg was slightly better. The lines were mostly of the young men and they were flaunting their indelible ink marks on their fingers and insisting they voted for Engineer Rasheed. Unlike other parts of north Kashmir’s Kupwara district, in Tekipora village of Lolab valley, there were no long queues outside the polling station located barely hundred meters fromHizb-ul-Mujahideen’s slain militant Manan Wani’s house. Out of 780 registered voters, only 96 showed up to cast their votes. The overall polling percentage in Kupwara was 52 per cent, Lolab 43, Langate 33. In Dever, Lolab the situation took an ugly turn when Congress’ chief agent was beaten by PDP workers. Half-an-hour later when Congress’ candidate Haji Farooq Ahmad Mir came to check the situation, he too was roughed up by the PDP workers. Mir had asked polling officers to check identity cards of people who have come to vote. He alleged that the said booth was captured by PDP workers and demanded re-polling. Interestingly, one person was arrested by the police and taken away as he has cast his vote four times already in Dever. Mir has filed a formal complaint in Lalpora police station naming a few relatives of PDP’s Haq Khan. In Sevar village of Lolab the scene was unlike Panchayat polls when people stayed indoors, this time there was brisk polling as people wanted to keep BJP out. “We don’t want our kids to be killed by bullets and pellets,” said a local. In Maidan Pora D, where two local militants were killed recently, only 109 votes out of 504 were polled. But the allegations of malpractice by PDP supporters echoed throughout. In Sogam, Advocate Rafiq Sogami, who went to cast his vote with his wife and son, was shocked to learn that his vote has been cast already. “I wanted to vote for Er Rasheed but my vote was already polled. There was no explanation from anyone how this happened,” said Sogami. In Kunan village there were minor clashes as people pelted stones on polling staff. But despite that over 40 per cent votes were cast. “People are fed up of Modi’s anti-Kashmir policies,” said a local voter. In Reshigund, Kralpora, a local was seen instructing voters to press a particular button inside the polling booth while officials looked on helplessly. In Uri, the voting ended peacefully, as 47722 votes were cast out of 83713 registered votes. “There was no untoward incident reported from any part of Uri,” said a local reporter. State’s Chief Electoral Officer (CEO) Shailendra Kumar put the cumulative voter percentage in the first phase involving Jammu and Baramulla, at 57.31 per cent. He said Jammu recorded a voter turnout of 72.16 per cent. The voter turnout was highest in Samba District at 75.07 per cent followed by 74.50 per cent in Jammu district, while twin border districts of Poonch and Rajouri recorded 70.40 per cent and 65.70 per cent, respectively, the CEO informed. Baramulla Parliamentary Constituency comprising three districts of Kupwara, Baramulla and Bandipora, having 15 Assembly segments, recorded 34.61 per cent polling- with the highest turnout of 51.7 per cent in Kupwara district. Unconfirmed reports said that a CRPF man died of a cardiac arrest while on poll duty in Bandipore.